The evolution of PC hardware is such that today's more powerful components don't run as hot or as loud as you might think. It wasn't that long ago that building a truly high-end rig required careful planning for lavish cooling solutions installed inside formidably-sized enclosures, but modern builds can afford to be smaller, simpler and kinder on the bank balance. 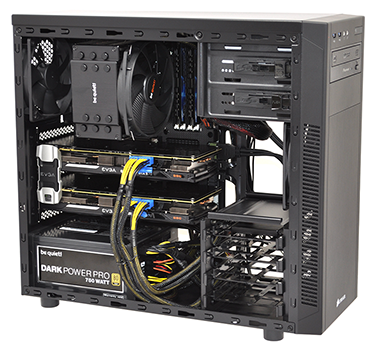 Makes you wonder, when using up-to-date components, can a budget enclosure cope with the demands of an overclocked CPU and multiple fast-running graphics cards? To find out, we have Corsair's entry-level Carbide Series 100R Silent Edition chassis in for review. Retailing at £50, the 100R Silent Edition is one of Corsair's most aggressively priced enclosures to date, and yet it has an even cheaper sibling - a regular version sans the Silent Edition extras can be had for as little as £43. But said extras might be worth paying for, as the small premium brings with it sound-dampening material throughout and a built-in fan controller. On the face of it, the 100R SE seems a neat little all-rounder, and it's not a bad-looking case, either. Measuring 471mm x 200mm x 430mm in size and weighing in at 4.8kg, the chassis is both smaller and lighter than many of Corsair's usual mid-tower solutions. The form factor makes it appear sleek and modest, while the arrangement of the front I/O ports (dual USB 3.0, headset, mic, reset and power) is simple yet tidy. The only stumbling block in terms of aesthetics, we feel, is the bulge in either side panel. The large square bumps detract from an otherwise smooth finish, and we suspect their inclusion isn't an aesthetic choice but rather a functional one - the chassis isn't the widest, so the extra bit of space behind the side panels could prove to be useful. Browsing the 100R SE's exterior reveals nothing out of the ordinary. Seven expansion slots are par for the course on a mid-tower enclosure, there's a small dust filter beneath the PSU bay that pulls out the back, and four plastic feet help prop the case up. 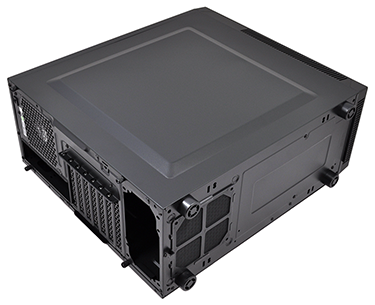 There's no filter up front, though the entire plastic fascia does pull away with relative ease, and the I/O panel is hardwired to the chassis, so there's no need to disconnect cables when removing the front cover. The only potential snag in this regard is optical drives - choose to have any installed and you may need to remove them before pulling the fascia away. Readers weighing up the differences between the regular 100R and this Silent Edition should note that the former has a perforated top panel with dual 120mm fan mounts. 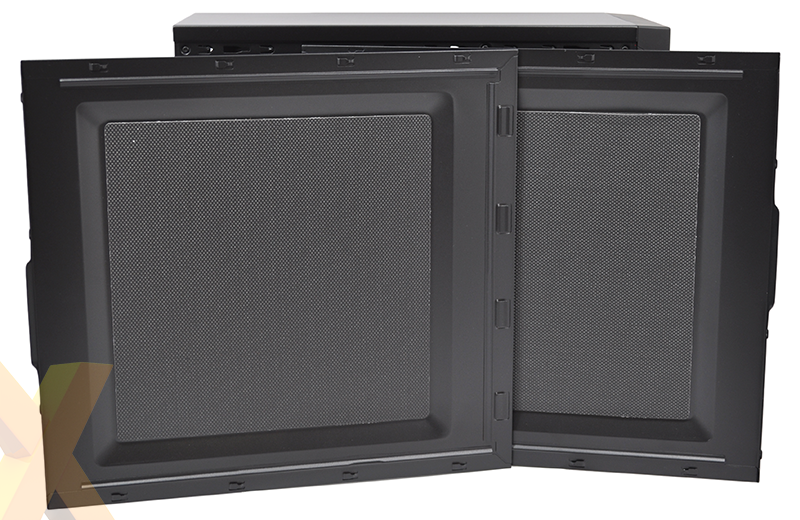 In contrast, the Silent Edition's top panel is solid and lined with the same sound-dampening material present on the front and side panels. 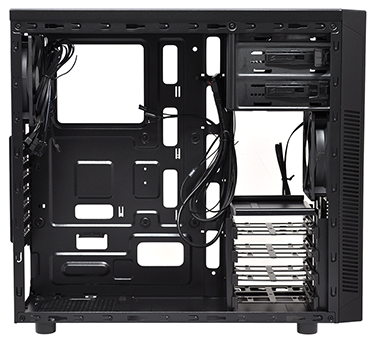 Corsair's notched and railed side panels come away after undoing a couple of thumbscrews to reveal an interior that conforms to modern chassis standards. The PSU is designed to be bottom mounted, there's room for a Mini-, Micro- or Standard-ATX motherboard, a good-sized cutout in the tray for CPU cooler installation, as well as a sprinkling of holes for cable management and a selection of cable tie-down points. The 100R SE has most of the basics covered, but as expected on a budget enclosure, basic is the key word. 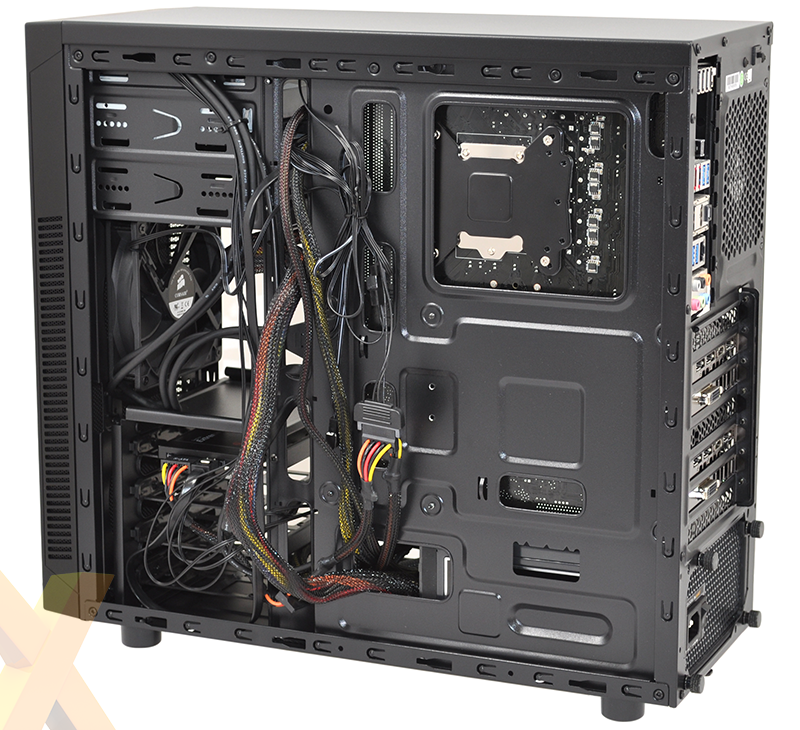 None of the cable-routing holes are equipped with rubber grommets for added tidiness, there's no hole for routing cables over the top of the motherboard - making it a pain to install the oft-awkward CPU power cable - and the entire internal area can feel cramped when using an ATX motherboard. 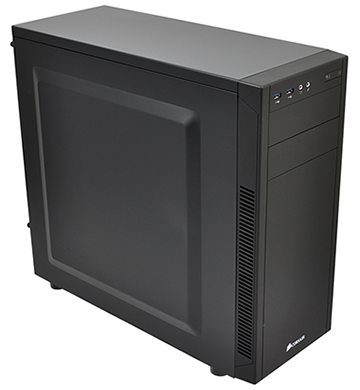 In an effort to put the available space to good use, Corsair has split the storage column in two, leaving two 5.25in optical bays at the top and a storage cage at the bottom outfitted with four plastic 2.5/3.5in drive trays. This arrangement leaves a path for front-to-back airflow, and Corsair provides two fans as standard - a 120mm front intake combined with a 120mm rear exhaust. 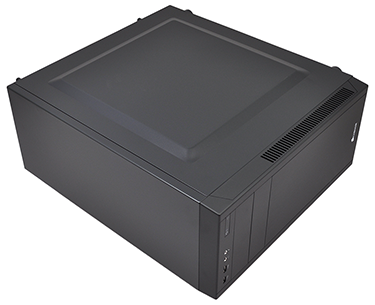 What's particularly handy is the built-in SATA-powered fan controller, which supports up to three 4-pin fans and allows a choice of low, medium or high speeds via a simple toggle switch on the back. A nice addition for a low-cost case. 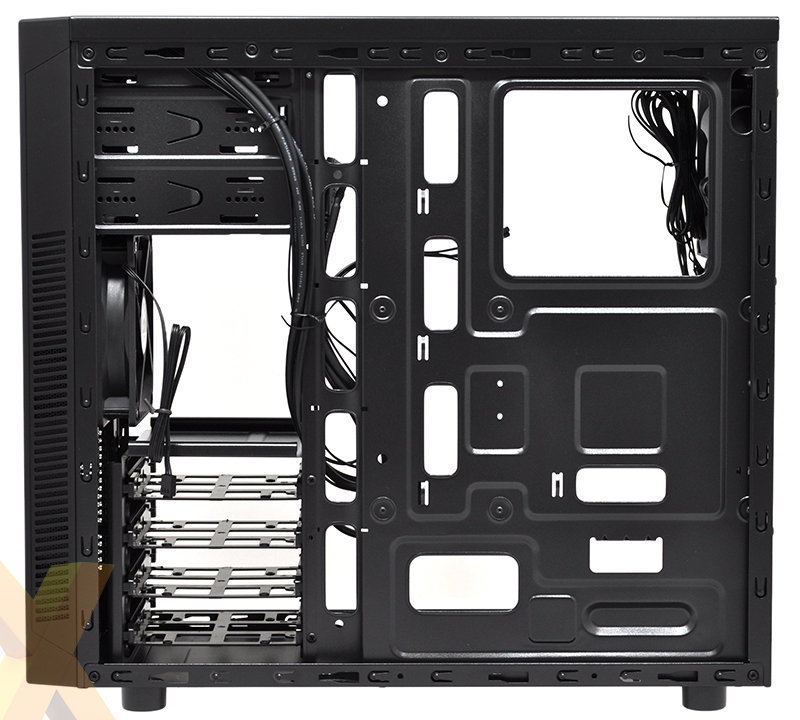 There's not a lot wrong with the 100R SE's general layout, but if you're planning a high-end build, the relatively tight confines make it a challenging enclosure to work with. Maximum GPU length is quoted as 414mm, but this figure drops to 275mm on the lower slots due to the storage cage, and while there's 150mm of clearance for a CPU cooler, some of the most extreme heatsinks may not fit. Our be quiet! Dark Rock 3 only just squeezes in, and we're glad the cooler was already attached, as the cutout in the motherboard tray doesn't allow full access to the mounting bracket. Highlighting the space concerns, our cable management looks a fright. 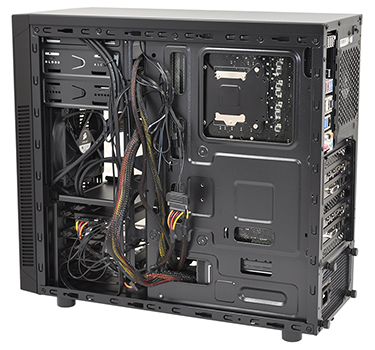 There isn't much room behind the motherboard tray to store excess cabling and keeping a multi-GPU build looking tidy is easier said than done. 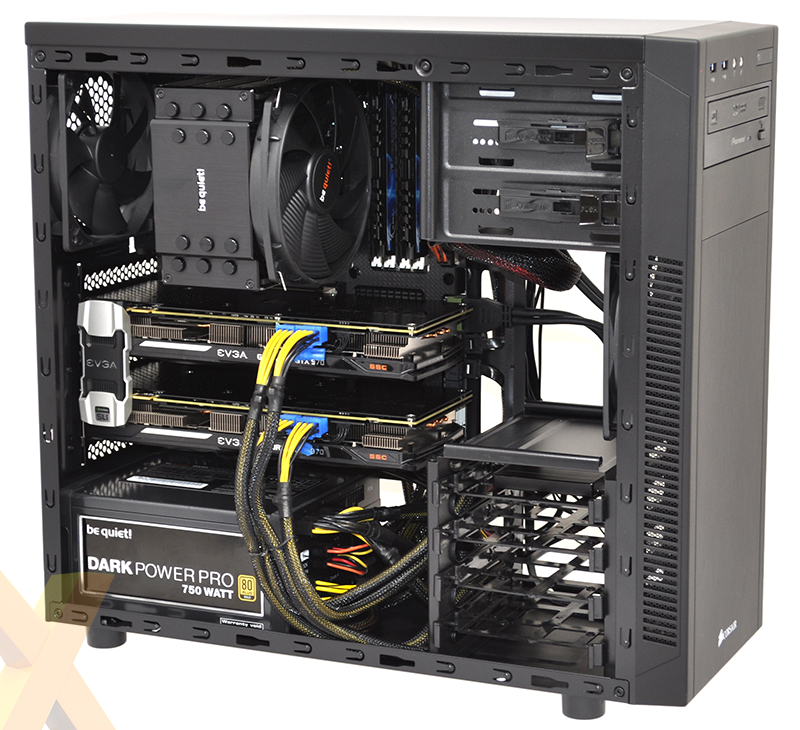 Having run into difficulty trying to re-attach the side panel, we eventually decided to keep our PCIe cables stowed next to the PSU where there's more room. Our experience of building into the 100R Silent Edition suggests that this is an enclosure well suited to low/mid-range builds, but can it surprise us by keeping cool our high-end test platform?